TEHRAN, Iran (AP) - Two Americans jailed in Iran as spies have been released from Tehran's prison after more than two years in custody. Associated Press reporters saw a convoy of vehicles with Swiss and Omani diplomats leaving Evin prison Wednesday with the freed Americans inside. They headed to Tehran international airport. 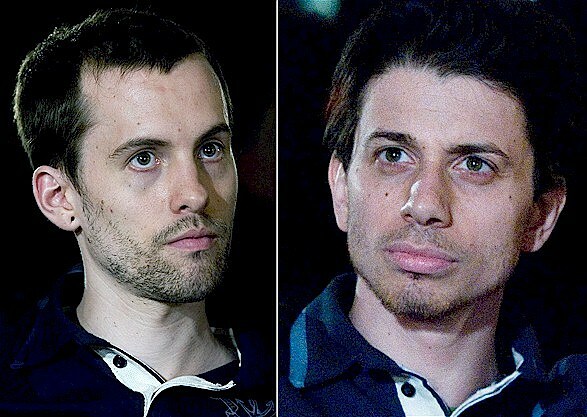 Shane Bauer and Josh Fattal were freed after their Iranian lawyer obtained signatures of two judges on a bail-for-freedom deal. A $1 million bail - $500,000 for each one - was posted. U.S. Sen. Al Franken has praise for the families of the two American men freed in Iran after two years of imprisonment. Franken says the families of Josh Fattal and Shane Bauer showed incredible strength and restraint while the two men were held in prison after being convicted by an Iranian court of spying for the United States. Bauer is from Onamia. His mother, Cindy Hickey, lives in Pine City.